The Sith operate in the shadows. As they unfold their dark machinations across the galaxy, they need a ship that matches their nefarious purposes. Casting a menacing shadow as it cuts across the skies, the Sith Infiltrator is the perfect choice to carry the agents of Darth Sidious on their dark missions and into the battles of X-Wing. With the Sith Infiltrator Expansion Pack, you can use the experimental cloaking device, devastating firepower, and advanced systems of one of these ships to deliver vicious surgical strikes before vanishing into the void. In addition to the finely detailed and fully painted Sith Infiltrator miniature, you’ll find a collection of five ship cards, including Darth Maul himself, twenty upgrade cards that help you fully utilize the ship’s systems, and all the tokens and maneuver dials you need to launch your own secret missions. 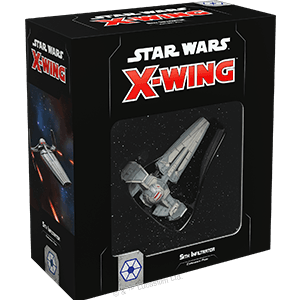 Wenst u het gezelschapsspel "Star Wars: X-Wing (Second Edition) – Sith Infiltrator Expansion Pack" aan te kopen?